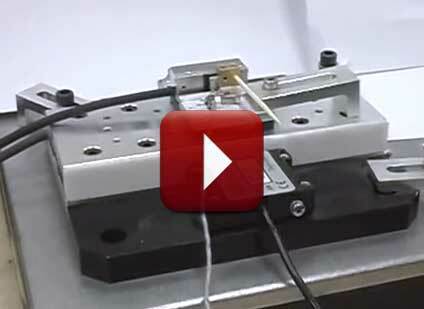 Vibration suppression has been utilized in precision motion systems for decades. As it relates to precision motion systems, various forms of vibration isolation are used to eliminate the effects of external vibrations or resonant frequencies in the construction that can be excited by the motion system. Precision motion systems have typically utilized vibration suppression ‘pads’ or damping materials, air isolation tables, or even forms of servo control, through a narrow band pass filter and series of calculations. All of these methods add to the system cost and can have limits in their functionality, particularly as it relates to precision motion systems. Nanomotion’s core motor technology is based on an L1 / B2 excitation of a piezo crystal, at a resonant frequency, to generate an elliptical motion at the ceramic tip. 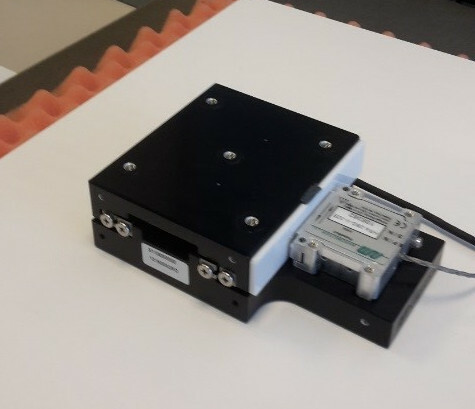 In addition to this ultrasonic standing wave, THE SAME MOTOR can be used in a B2 mode only, generating the ability for suppressing vibrations from the sub-nanometer level to several hundred nanometers. The “DC Mode” within Nanomotion’s product line allows the seamless switching between an ultrasonic mode and a bending mode. The bending mode leverages standard piezo actuator principles, with sub-nanometer resolution and the ability to operate over +/-300nm, up to 1kHz. 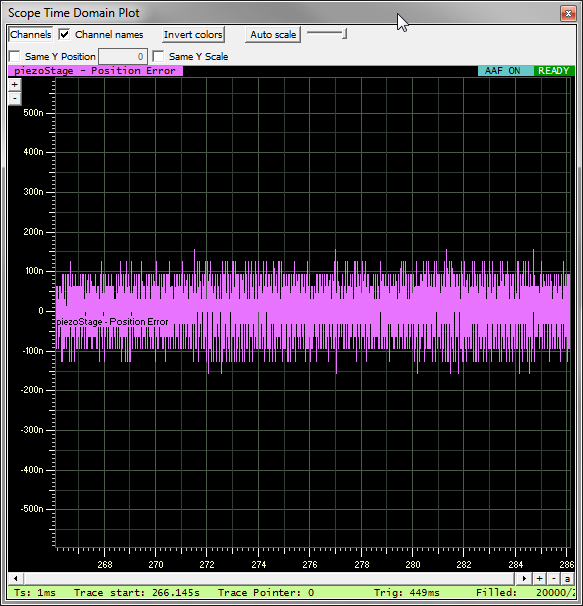 Utilizing a 30 picometer encoder resolution designed into a precision linear stage from Nanomotion, we have demonstrated 0.1nm position stability, at the encoder, without temperature or vibration control. Click here or on the graph to view larger image. 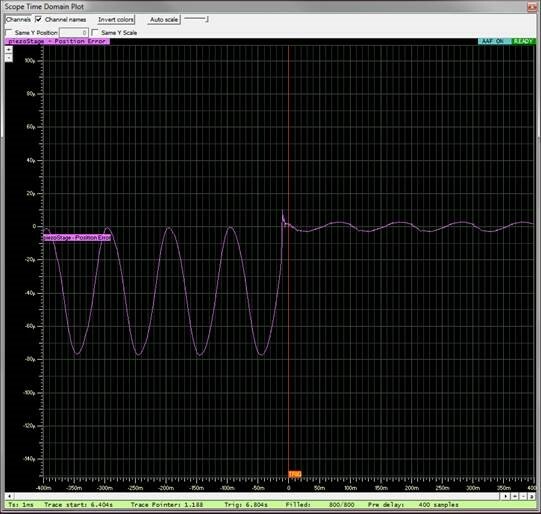 This graph represents the same axis shows a 78nm disturbance, seen on the encoder and a point where vibration suppression is turned on. The vibration suppression brings the axis to a stable position within 6nm, eliminating the impact of the vibration. The multi-function capability, designed into a single axis can eliminate the need for cumbersome external vibration suppression. As motion systems strive to meet the performance demands of the next generation of semiconductor tools or face the challenges of vibration from airborne optronic systems, the ability to utilize the dual modes designed into the same axis, provides unmatched performance, improving precision and system reliability.